Do You Need Affordable Storage? First of all, for the best Gold Coast Caravan Storage look no further. Oasis has opened a brand new modern storage facility with fantastic prices. Also, a bonus feature we offer is our boat and caravan washes, another reason why our service is so popular. With customer feedback; we know what's important to caravan users. Will Your Caravan Be Safe With Us? - YES! Oasis Storage offers first class security with new CCTV surveillance 24 hours a day, 7 days a week. Also, for added safety, our facility has a full security fence. In fact, what we aim to give clients is peace of mind and complete confidence knowing all valuables are safe in our hands. If you’re tired of paying too much money for storage elsewhere or simply need to move your caravan from your driveway or garage - Oasis can help! 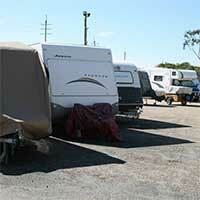 Caravan storage can be expensive, and there are often hidden clauses in contracts. This could be taking more money out of your bank account than necessary. So, if you’re tired of long contracts and hidden fees, talk to Oasis, no long-term locked-in contracts, (1-month minimum). Simply pay for what you need! Browse our useful website to find out more about self storage, or stop by and talk to a friendly staff member. For more information about our great storage options, features, and pricing plans, call today! Whatever Your Storage Needs - Oasis Ticks All The Boxes! Need to de-clutter your home before showing it to potential buyers? Oasis Storage right here on the Gold Coast, we'll meet all of your storage requirements. Fantastic value, we respect all budgets - 10% discount on self storage - Don't miss out on this special offer! (T's & C's apply). Call us today - 1800 971 771 - or drop in for a chat!